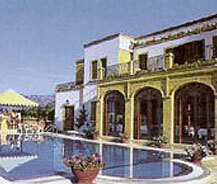 Colonnade Club Hotel is located near the Kyrenia, Northern Cyprus. It is just a mile away from Kyrenia. It is set in the lower slope of the mountains and the view of the city from the balconies of the rooms is awesome. It is one of the best boarding hotels present in the Northern Cyprus. It is 44 km away from the airport and it is located at the business center of the city. It is a 2 star hotel and the facilities and other services provided by the hotel authorities are extremely good. It provides 24 hour wireless network connection with very good bandwidth speed. Rooms are fully air conditioned and there are satellite tv in each room. It has a very clean swimming pool at the back with a restaurant attached to it which provides all kind of foods throughout the day. Online pre-booking option is available which you can make through them aswell. There is a cocktail bar that services as a hotel facility and it is known for its interiors. You can find all the famous tourist spots near to this hotel which makes your travel an easy one. You should never miss this hotel while your tour to Kyrenia.